This one seems like a no brainer, but you would be surprised. We’ve all seen it, 14-year-olds are somehow immune to cold temperatures! They walk around in their converse and hoodies as if the sleek ice is of no threat to them. But for the rest of us, boots and a warm winter coat is essential. Bundle up in a warm hat, scarf and mittens. Yes, MITTENS! Sure, they’re not the most convenient item of clothing for texting, but they keep your hands warmer than gloves do, therefore they are a winter in our books! We understand that it is extremely difficult to keep your phone away from your twiddling thumbs. But for the sake of your safety and wellbeing, we recommend keeping your phone in your pocket, and your hands out of pocket. If you slip while your hands are in your pockets, you may not have enough time to save yourself from a bloody nose. Rock, salt, kitty litter every single outdoor surface that you possibly can. With weather conditions such as these, ensuring that your first step out the door isn’t the last one of the day is fairly important. To avoid slipping and sliding up and down your driveway, we recommend taking an extra couple of minutes out of your day to protect yourself from any unfortunate falls. 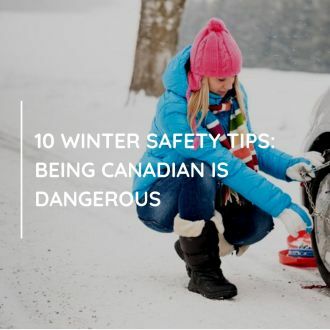 For more winter safety tips -- especially for those of you driving -- visit our blog! WILL DIGITAL SCHOOL DAYS REPLACE SNOW DAYS? A Picture of an Egg is Ruining Your Teen's Life.